Sea plantain is in the Plantain family (Plantaginaceae) and is well-equipped to stand up to the harsh seaside climates. Its strong taproot extends deep into the ground acting as an anchor. The narrow, slightly wax-like covered leaves group into a tight rosette that can take constant spray from the sea. This species might grow slightly inland from the coast line if the wind carries the salt spray far enough inland. It is not frost tender and is noted for attracting wildlife. This hardy plant can tolerate short periods of time being underwater. Distinguishing Features: Sea plantain is an herbaceous perennial plant with a dense rosette of stemless leaves. Each leaf is linear, thick and fleshy-textured, with an acute apex with three to five veins. 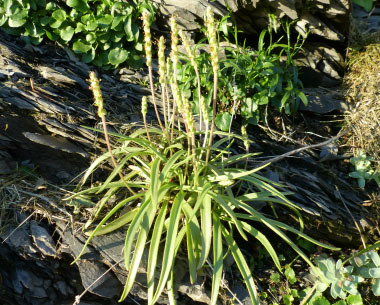 The flowers are small and produced in a dense spike. 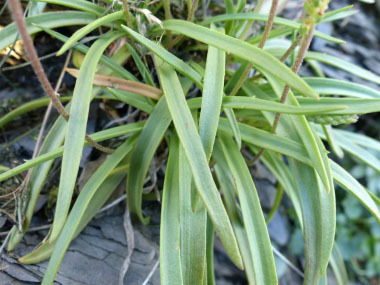 This plant is easily identified as is often grows out of the sand or rocky sea sides. 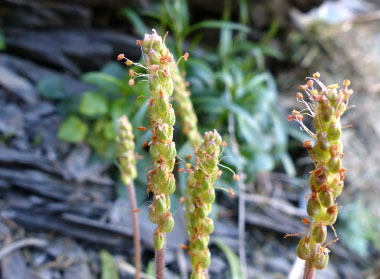 It closely resembles its family member Plantago lanceolata . Sodium chloride (NaCl) levels determine root morphology. Flowers: Flowers are greenish-brown to almost reddish depending on conditions. They are very small, (about 3 mm wide), and fused. The calyx is 4-lobed. 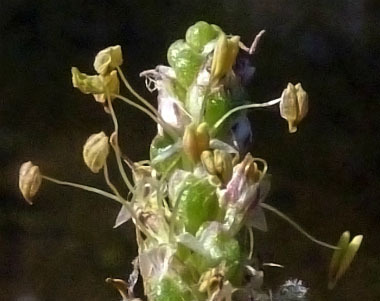 It has 4 stamens, long filaments, and the anthers are pale yellow. Inflorescence is a long, cylindrical (rarely short–globose) spike. Flowers bloom from June to August and the seeds ripen between August and September. Fields of Nutrition has medicinal benefits and vitamin/mineral content of Sea Plantain. Leaves: They grow in basal rosette, unclearly stalked. Greyish green leaf blades are linear to linearly elliptic, fleshy, with entire margins (sometimes sparsely toothed), parallel-veined, and almost glabrous. Sometimes the leaves may have black spots. 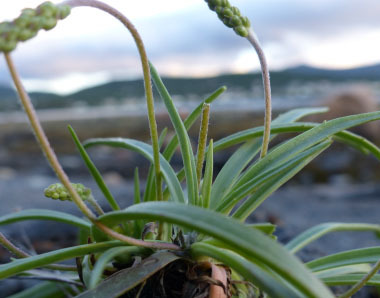 Height: Sea plantain grows anywhere from 10 to 30 cm (4 to 12 “) tall. The stem is leafless, has an arching base, is round, and has a sparsely haired scape. Habitat: This plant can be found along sea shores, in sea-side meadows, and even beside salted roads. It is native to most of Canada, the U.S., Europe, some Arctic regions, northwest Africa, northern and central Asia, and southern South America. Edible parts: The leaves and seeds are edible. Young leaves can be consumed raw or cooked although fresh is best and has a pleasant taste. This is one of the nicer-tasting and more palatable (when fresh) members of the genus. 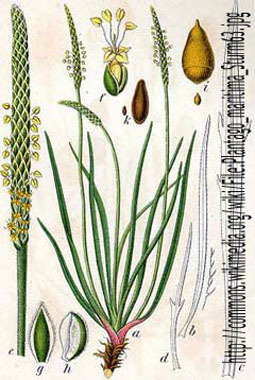 Seeds can be eaten raw or cooked; and they can be ground into flour although they are tedious to harvest.